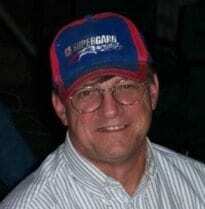 What a treat – our friend Tom has agreed to show us how he started with the bear pattern on this site. I must say that my bear played an extremely small part of this project – and if you glance at the photo above you’ll see what I mean! 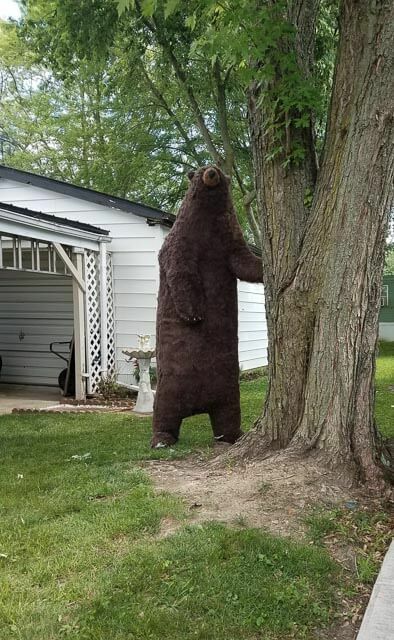 Tom created a huge life-sized standing bear sculpture, and even added fur – it’s now displayed outside his home, and you can just imagine how impressed his neighbors must be. Thank you, Tom, for letting us see how your amazing bear sculpture was made! 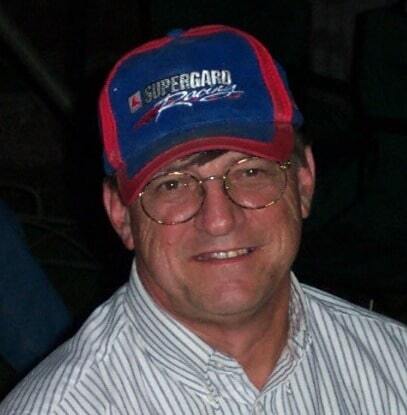 My name is Tom and while now retired, my life’s passions, besides my family, have been music, poetry (The Poet’s Crafts is my blog) and arts and crafts. I hope you enjoy my guest post and thanks to Jonni for having me. In Denver, Colorado, there is a giant big blue bear with his nose pressed to the glass, peering in at everyone, staring in through the front windows of the Colorado Convention Center. The 40-foot, 3-story fiberglass construction has become an icon of the Denver area, representing a “playful reflection of curiosity” to all those who come there to meetings. 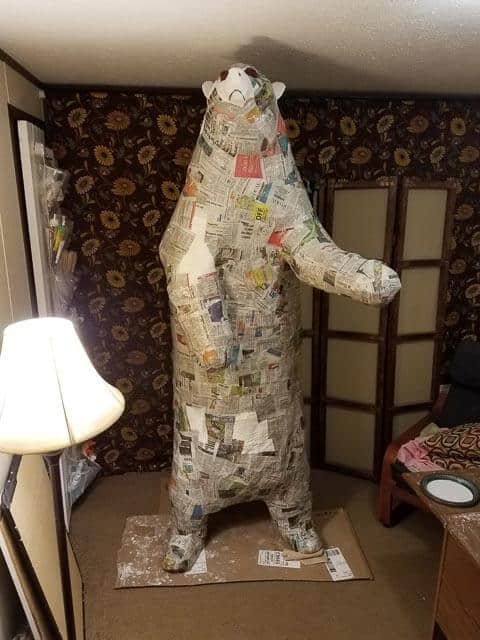 I have long admired Lawrence Argent’s whimsical creation for its out of the ordinary presence in the city; hence,when Jonni made her bear trophy mount pattern available, I thought I would try to create a full size bear sculpture. Thus, it became a passion for me and my second attempt at an outdoors creation. Step 1: First I found various pictures of all kinds of bears in the upright position. 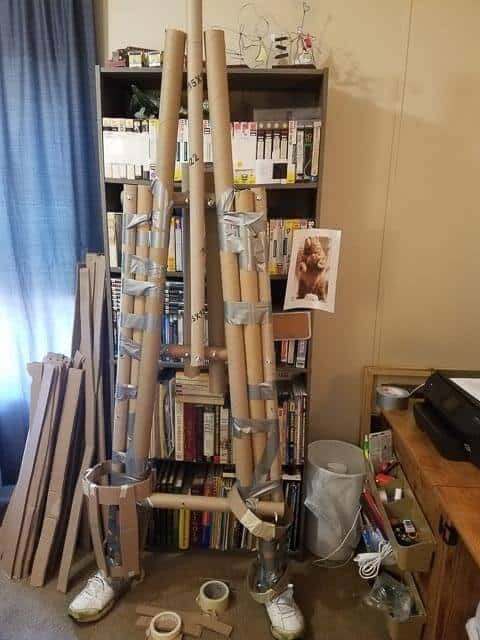 Next, my thinking was to use pvc pipe to construct the armature until my wife, who works at the local Jo Ann’s store, brought home some very strong cardboard tubing which I used instead. Starting with his feet, I used an old pair of gym shoes to which I attached the tubing with bolts and duct tape. 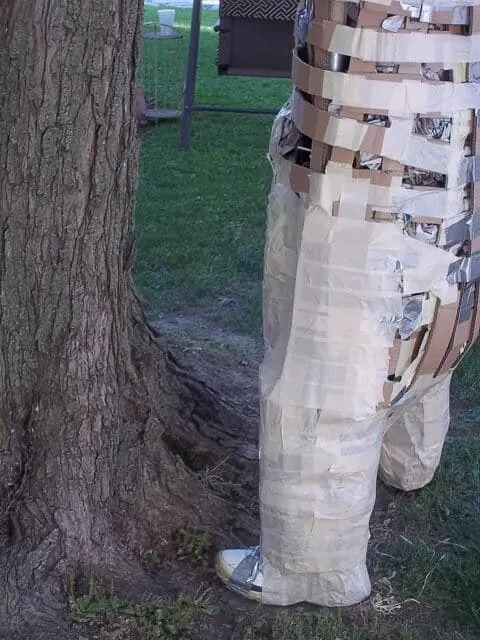 Step 2: I sort of envisioned a “walker” in setting up his lower body shape, placing a taller tube in the middle of his back to serve as the spine. Later, I would add another tube to give him height. 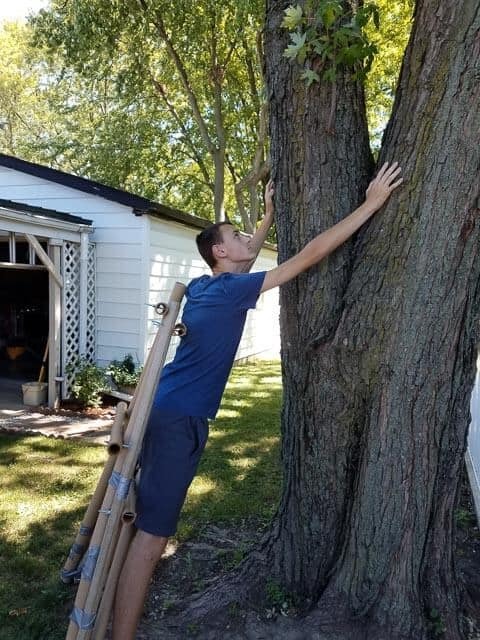 I used my grandson, Austin, to pose up against the tree to give me a visual about what I was thinking in my mind. If you look back at step 1 you will see how I started using cardboard strips, first in circles and then connecting them with straight strips. Using this method, I was able to envision how bulky I wanted his legs relative to his feet, etc. Continuing in this fashion, I made a larger ring up where his shoulders might be and ran longer cardboard strips, connecting the bottom portion with the top portion. Step 3: Next, I wadded up newspapers and put them inside the cardboard frame, and wrapped the frame with masking tape. Keep in mind that you may be doing a lot of adjusting along the way in this process, as your creative mind thinks aloud in your ever-changing mind. Exploding ideas are not static, right? Step 4: Next, I had to run a higher tube to hold his head, which I placed in a furnace duct vent elbow piece so as to be able to move his head to the angle I wanted. 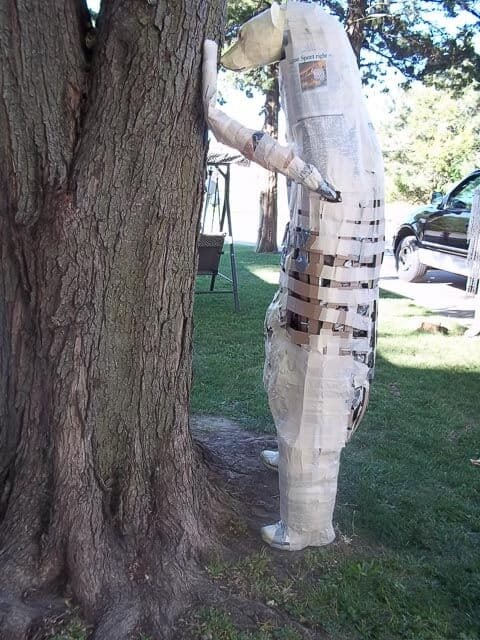 Step 5: In step 4 as well as step 5, you can see where I have started experimenting with his arms, which I made by using hangers inserted in tubing before covering them, so I could fixate how I planned to lean him up against the tree. Step 6: In this step, I have moved him back inside to mask his skinny frame. 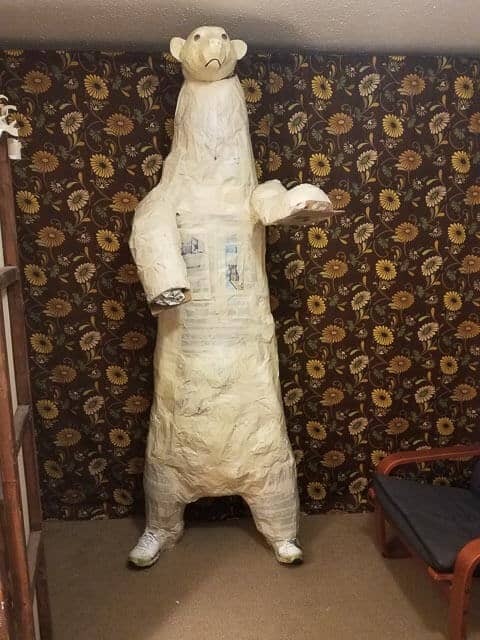 At this point begins the layering of masking tape, adding more newspaper in spots, more masking, etc., until you are satisfied with his body form, at that moment. Of course, you have to let layers and improvement areas dry before proceeding. And, of course, it is important to note that I have used paper mache paste and straight glue in certain spots to provide more strength and to simply satisfy my thinking. You may not be as insecure in your thinking. Step 7: Now you can notice how much he has transformed. Step 8: I now start another layer of plaster cloth before I add another layer of paper mache. Step 9: A new product had come onto the market when I was starting my Walter Project , a product called Flex Seal®. This product was introduced not only as tape but also as a sealer, with numerous applications such as roof patching and basement cracking, among others, to hold out water leakage. When dry, it becomes rubberized. 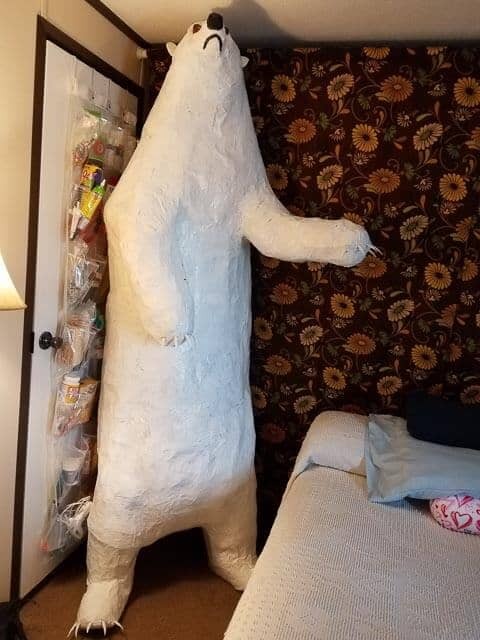 I decided to cover my bear in white Flex Seal. 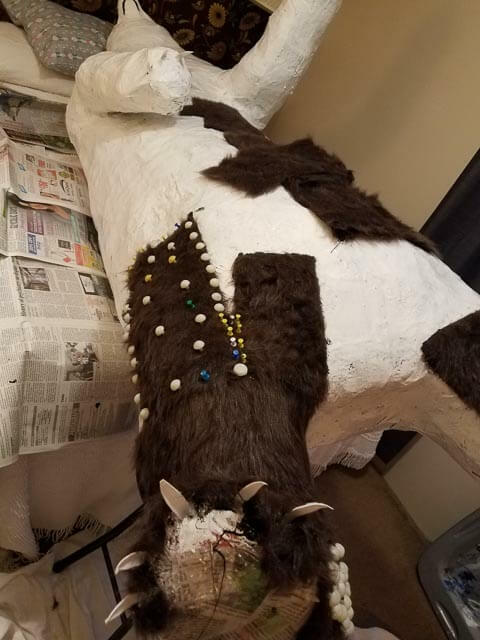 Step 10: And after adding nails to his appendages, I was ready to add fur. However, at this stage I started falling behind because I could not find a glue that would adhere the fur to the shiny flex seal surface. This hold up curbed my enthusiasm and I also became ill and incapacitated for a few months. Step 11: Finally, I resolved the problem of adherence by applying black Flex Seal to the white Flex Seal and pressing the fur down, holding it in place with poster board tacks/pins until it dried thoroughly. Step 12: This stage may challenge your patience, frustrate your joy and produce unfavorable thoughts as you have to measure and cut and line up many patches of fur as you meander your way covering this big boy’s body with “hair.”And, by the way, the fake fur was purchased at JoAnn Fabrics, where locally, it carries it as a regular shelf item. Finished: Finally, Walter is finished and is happy waiting for any varmint that might happen to pass by Thanks again to Jonni who made available this wall mounted bear plan which enabled me to add a little more body to him. For that, Walter says thanks! Sorry I’m just getting back to you but have been out in Colorado visiting a daughter and her family. This last summer was ‘Walter’s’ first summer in the elements and, in all truth, he did really well, exceeding my expectations. Keeping in mind that I sprayed his fur five or six times with Scotch-guard before setting him outside, keeping in mind that I had every intention of covering him up in anticipation of violent storms, nevertheless, I wasn’t always able to do that and he just stood there in pelting rain, three or four times, and never batted an eye. (at least I didn’t see him lol). I wiped him down with a towel and was always impressed with his condition. I checked him almost every morning since my real concern was bugs and squirrel damage. I found a little yellow spider only once and no other bugs. I saw a squirrel come down the tree and run down his back but never found any damage. He did really well. He’s been ‘hibernating’ inside for the winter and I plan to put him out sometime in May and maybe with a little cub which I plan to put up in the tree. Thank you for asking about Walter and I hope you great luck in your creations. I didn’t plan on him being 6’8″; he just turned out that way. lol My best wishes. Thank you for getting back to me. Walter is so lifelike, I just hope someone doesn’t shoot him thinking he is a threat! He is beautiful. While driving in the Rockies in Colorado, recently, I was telling my son-in-law that I should stand Walter up against one of those Aspen trees. Then we both in unison said, “Not.” haha! Thanks for all your kind comments, Lila. I’ll mention them to Walter. lol Have a great summer! This bear is wonderful! I am so impressed. If driving by your house, upon seeing Walter, I’m afraid I would hit the gas and drive away from him as quickly as possible! He is so lifelike. You did a magnificent job. Thank you for sharing your talents and thoughts with us. I’m curious, do you have any problem keeping him from being subjected to the elements? I would be afraid he would be rained on, etc. 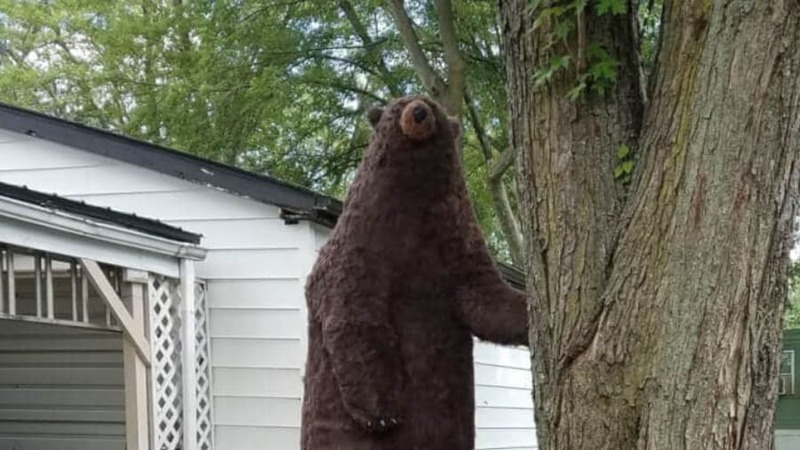 oh I’m crazy about bears so I loved this…great idea about the flex seal because I’d love to put one outside my house! I must say, Linda, that it has garnered a lot of attention and admiration. And it held up really well the first summer. I had to replace a couple of paw nails due to moving it but all-in-all, Walter weathered the elements in impressive style since I really didn’t know what to expect. He’s in the house hibernating for the winter. I’m working on a cub to sit in the tree and hope to have him ready sometime in the spring. I’m excited about yours and can’t wait to see your pictures. Well, Jonni, I’m diligently working on trying to transform your bear pattern into a baby bear head not meeting with acceptable success at the moment. However, I’m confident that I will be able to do that and if not, I’ll have to do a lot of sketching from pictures until I’m satisfied. And if you don’t mind, I will submit it to you for your valuable thoughts on it before I start the project. I really admire your practical approach to your projects. Thanks. A bear! Oh my! Thank you for sharing your process. Your tutorial and your artwork are wonderful. I have all sorts of ambitious projects lurking in my mind, I just lack the skills (or the courage). I’m working on the skills thanks to Jonni. Her books and this website are invaluable. And getting to see great artwork like yours and learn how it’s done is very encouraging. Thanks for the kind comments; that certainly helps my outlook on doing future projects. My wife wants me to make a baby cub bear now…..oh no! lol I think I hesitate on doing things because of “courage.” So you have to ask……what defines ‘courage?’ For me, it must mean being afraid to start for fear it won’t come out the way I envision the outcome or once I start I have to persevere through to the end or maybe I’ll unmask some problem I couldn’t see coming and on and on until I’ve procrastinated and talked myself out of it. Sounds funny but probably true. Nobody wants someone to laugh at them and therein lies the bottom line…….afraid that your idea may not be well received or even, liked. Of course, that’s in my own case. However, Rhonda, just do it, have fun and say “this is my____and I did it! Hope you like it.” And you will feel great about yourself and, we don’t want to believe it, but many people will love what you do cause people are wonderful and appreciative of your effort and the other ones, who are cruel, don’t count Sorry about my rant but be happy with your endeavor, no matter what it is, cause your passion is your commitment. Again, thanks for y our kind words and comments. Thanks Ben. You have to get ‘crazy’ once in a while, right? People really like it but he did get a little tall on me. The wife says….a little Cub now……really? Thanks for the comment. I am in awe That is Amazing. You are an inspiration. Well done. It’s been said ‘it’s a thin line between sanity and insanity’ and I think I went under the line for a while. lol There were moments when I wanted to shoot him; luckily, I didn’t have a bow….haha! I appreciate your kind words, Allan. Greetings from the Highlands of Scotland, where we don’t get a lot of bears (well, none actually!!) Walter is absolutely amazing, thank you for sharing your process. Love the fact you used an old pair of shoes for his feet what a good idea. The children that come to see him, what an opportunity to teach them about bears/wildlife. A school outing in the making! Are you going to do a baby bear to go with Walter, that would look super cute. Thanks again. Thank you very much. I am happy that ‘Walter’ came out better than I thought. I believe the fake fur took him over the top, so to speak. Families drop by with their kids to see him. Bugs and squirrels have avoided him, so far, in these 90 degree days. I like that you responded with your nice comments. Thanks again, Gloria. Great work. love your thinking and how you solve the problems! Thanks Patricia. 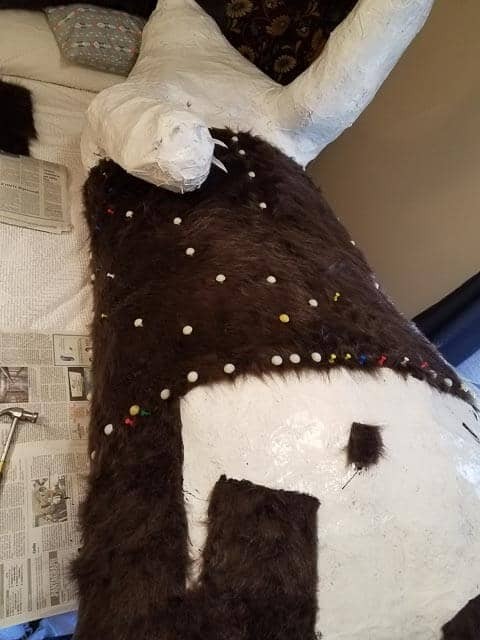 Using Jonni’s wall mount bear head pattern I just began wondering if I could add a body to him not knowing I would make him 6’8″. As you probably know, thinking on your feet can sometimes make for a lot of extra work but it was all fun. Thanks for your comments. You were very kind. Great job, Tom! How do you think the fur will hold up outside? Has he been outdoors long, and how has he fared thus far? Thanks for your response. He’s been outside a week in the searing temperatures and one fairly hard rain. So far so good. If I know it’s going to rain I will cover him with a tarp however I do want to know how the fur will hold up and there will be times when I won’t be home when it rains I’m sure. Before I covered him in fur I sprayed a sample of fur with Scotchguard a few times and left it out in the rain and it seemed to do real well since it’s designed to waterproof fabric. So I’ve sprayed him a few times with that. My concern was squirrels and bugs but so far he’s stayed clean. I check him every morning and so far I’m very happy. Families have brought their kids by to see him and pet him. Thanks again for commenting. this was such a pleasure to read about. Thank you so much for posting the process. Walter looks fantastic! Thanks Nan. A crazy notion but a lot of fun. He came out a little bigger than I was thinking at 6’8″ but he looks good against the tree. My wife wants a cubbie next. lol Thanks for the sweet comments. great infor and gives me the courage to work on my big dog project as a raffle item by october. Thank you very much. I just started out thinking off the top of my head and changed my mind a lot looking at bear pictures. I’m happy with the results. It takes courage though cause I told my wife, if it doesn’t look like a real bear I won’t put it out. lol The big dog project sounds exciting and for a raffle at that. I wish you great luck and I hope you post pictures when you’re done. Thanks for your sweet comments. You make me feel good. Thank you for sharing! What persistence and patience! I appreciate the ‘Flex seal’ tip as I’m interested in one day making a large piece for outdoors. Thanks for responding to “Walter.” And you’re right, it did take a little patience since I changed my mind a lot of times. But it was fun and the result was a happy one for me. I told my wife, I’m not going to set him out if he doesn’t look like a real bear. lol Flex Seal is a good sealer Pat although, for a while, I couldn’t find any glues that would stick the fur to it. So I stuck flex seal to flex seal and that did work. Thanks again for your kind comments. People stop and stare; some have brought their kids by; some have even asked if their kids could pet him. Thanks for your kind comments, Jan. I told my wife, if he doesn’t look like a bear I wasn’t going to put him out. lol I am happy with him though. He’s been out a week and so far the bugs and squirrels, my main concern, have not bothered him. Thanks again. This is amazing art, Tom! Your vision and abstract thinking made a beautiful piece. I’m curious about how much he weighs all finished. I never thought about him that way but, you know, he is “beautiful.” Thanks for that. 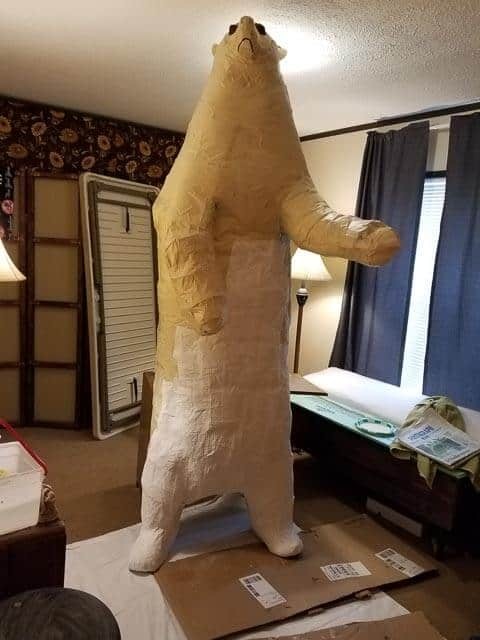 I told my wife, he’d better look like a bear or I won’t put him out. lol Honestly, paper mache can be light but when you start adding layers of it plus plaster cloth and paper mache paste, etc., it does get heavy. Walter is 6’8″ and he does have a little weight; unfortunately, I can’t tell you how much. It took my wife and me to take him out and situate him. Thank you very much for your kind words. How AMAZING, Walter! Good job! I was wondering how the fur will hold up to outside elements….particularly, the rain and sun? Will the sun bleach out his fur or is he shaded well with the tree? Also, is Flex Seal reasonably priced and does it go a long way? Thank you SO much for sharing your artistic talent with us! First, thanks for your sweet comments. I will surely tell ‘Walter.’ lol I have had him out a little over a week now and while he is in searing sun til about 11am, he is shade a good part of the afternoon. So far I haven’t noticed any bleaching in the 90 degree days we’ve been having the last couple of weeks. We had one good rain and being home, I covered him in a tarp. However, I have Scotchguarded his fur a lot to test how he will do in inclement weather. I expect him to do well, however. I do check him every morning for bugs and possible squirrel damage, but so far he’s done excellent. Our Walmart carries the Flex Seal products and although my wife got it, I think the quart can was between twelve and fourteen dollars. The price varies in different stores. I really appreciate your responding Janet. Thank you “TOM”! I’m sorry that I accidentally mixed up your name with your bear’s name! Yikes!? Do you remember how many containers of Flex Seal you used on your wonderful bear? No problem, Janet, that’s funny. 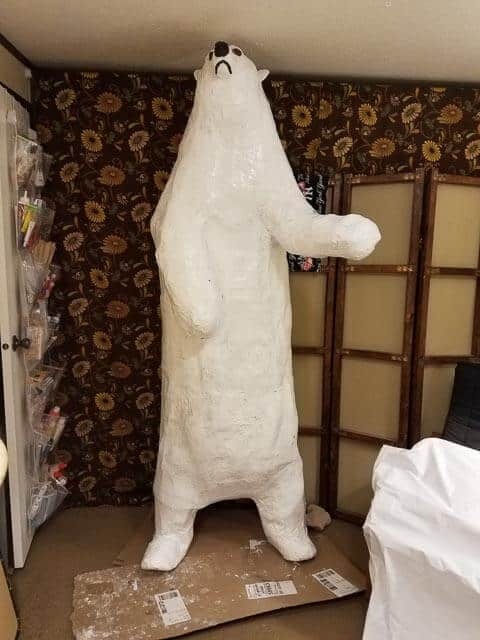 I did use Flex Seal liquid and I started with a 16oz can of white, soon discovering that that wasn’t enough to cover this bear. So I had my wife buy a quart of it so I could finish covering him. The problem I had with Flex Seal was that since it dries rather quickly, it had a tendency to rubberize in the can as I used it. One can I evidently didn’t seal tight enough and the next day it was completely hard and rubberized in the can. They call it liquid but it does have a consistency about it, in my thinking. I didn’t think it was the easiest to apply because it was a little thick. But it was my first time using it and it definitely seals good. If your projects aren’t too big, I would suggest starting with the 16oz can. There is also Flex Seal spray but I haven’t tried that. That’s okay; that’s funny. Being a new product and thus not knowing, I bought a 16oz can of white Flex Seal liquid. The problem with this product is that it dries quickly and is a little thick, making it sort of ‘gummy’ when applying. At least, to me, it was. I possibly did not seal it completely tight when I was done using it at first, although I hammered the lid down like I usually do any paint can, the next day it was as hard as a rock when I tried to put my brush in it. I had my wife buy a quart can of the white to finish him up. 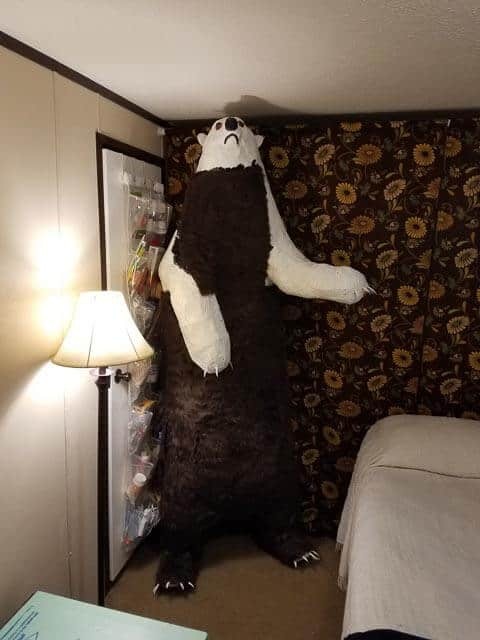 I bought 16 oz cans to apply the black liquid Flex Seal to the fabric and the bear. Thanks for getting back with me. Whar a clever idea to use Flex Seal to weather proof Walter! We’ve used the roll on liquid and the spray to patch the camper roof. From our experience, I wouldn’t bother with the spray. It didn’t hold up to even one rain. Did the liquid hold up? Someone else that I was talking to wasn’t too impressed with the spray, either. My first outdoor project was giant mushrooms, which we really liked; sealing them was unsuccessful. When I was toying with the bear, Flex Seal was bombarding the infomercial airways and I thought that the liquid would work and it did. Sad to hear about the spray since I was thinking of trying it on my next attempt at mushrooms. I appreciate your information. Thanks for the comments! The liquid has held up well. We haven’t had to replace anything patched with that, which is always a plus! Just an update, Janet. The fur, thus far, is really holding up well. And surprising enough, no bleaching has occurred yet. That was another variable that concerned me a little, at first, too, but as long as he doesn’t turn yellow (lol) or red, I don’t think it will matter much. After all, human hair bleaches out too. My best to you. I absolutely love it! Great job! I hope that I am as creative and bold as you when I retire and have more time. We have bears up here in WNC so I have been thinking about making one for my wall. Once again, I am so glad you shared your creation. It is awesome! You’re so nice. Thanks for the sweet comments. I wish I lived closer to an area where the bear lived. I hope you make one for your wall. 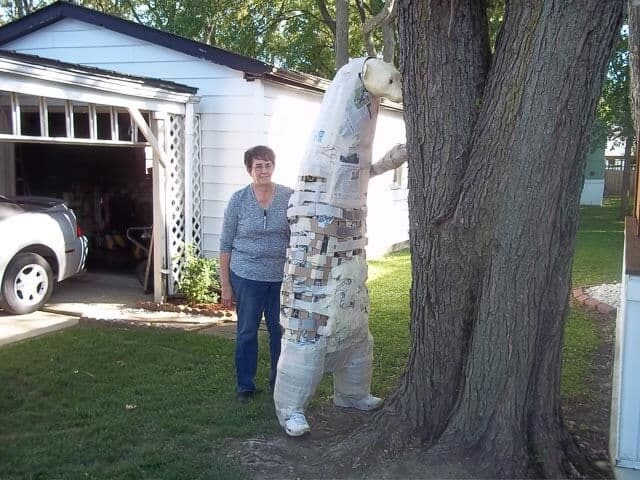 I was going to do that, but sitting on the porch swing and looking at that tree, I decided I was going to make me a standing bear if the head came out believable. I told my wife, if he doesn’t look like a bear, I wasn’t going to put him out. lol Again, Bettie, thanks for the kind compliments and I truly hope you do make your wall mount. You did an amazing job on this bear. Thanks for sharing the steps and for the tips. I appreciate your honesty about frustrations and your determination to complete Walter. I hope you are well and happy. Thanks again. Thank you for your sweet comments. I will tell ‘Walter.’ lol It helps to be retired because projects can become challenging. I didn’t get sick because of my bear but I was concerned over whether I could get him done or not. I am happy how he turned out and he is garnering a lot of attention, especially families with small children. Thanks again, Penny. Wow Walter is amazing..I had wondered about using flex seal myself, noe I know it will work, thanks..I’m just starting out, I haven’t made anything wonderful yet, but thank you for all the inspiration, tips and information. Thank you Maria. I am quite happy how he came out. At 6’8″ tall, I thought, at first, that he was too tall. But against the tree I think he looks okay. Passerby’s seem to be really intrigued by him; many families bringing their little ones. Good luck in your craft endeavors. Love your gigantic bear!! It would’ve been just as cute/cool to leave him white, make him a polar bear!! Very nice job; I love the shoes as the feet!!! It was in fact hard not to leave him white. Thanks for your comments. I’m looking at bear pictures, my old gym shoes in my waste paper basket near my feet in the room I was working, which is where my computer is, and I put the tubes in them just to hold them up when it entered my mind to use them. ha!